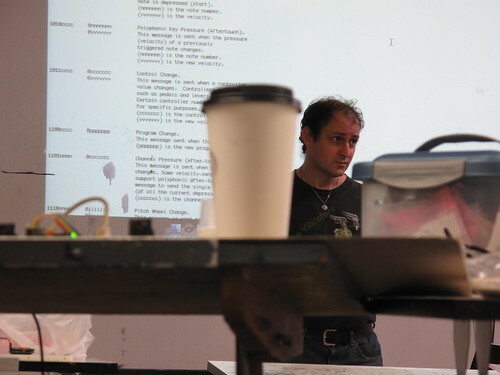 This month, the Arduino Cult Induction workshop series focused on sound. 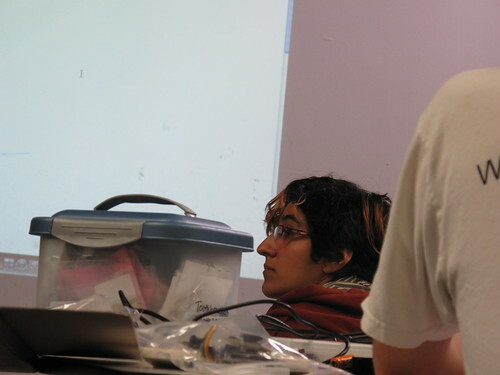 This morning I woke up, ate some food, and headed to PNCA, where the Arduino workshop on making crazy sounds was to be. After a short lecture, everyone begin working with electronics, and I am happy to say that the room is filled with crazy sounds. It is like a strange cybernetic orchestra, with each piece of electronics playing an individual part. Donald Delmar Davis of Tempus Dictum went over creating sound using the Arduino’s built in Pulse Width Modulation (PWM) and Direct Digital Synthesis using resistive ladders. He investigated using the Piezo element as both a simple speaker and an input trigger. He reviewed the Musical Instrument Digital Interface (MIDI) from a hardware and software perspective, and looked at a couple of useful integrated circuits (the lm324 and the lm368). Although all of the noise makers are based on the same chip, each has a unique and different voice. Additionally, the workshop is going on in an art room, so people have taken to walking around the room to look at projects as if they are art. Dorkbot – Focused Workshop, 30Nov08, Making Noise with the Arduino from Amber Case on Vimeo. 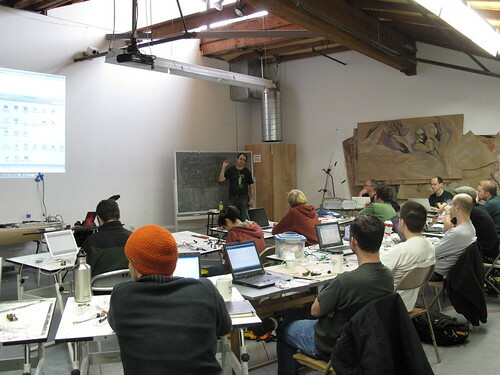 The Arduino Cult Induction series of workshops are Sponsored by Tempus Dictum, Inc. in support of DorkbotPDX. Arduino workshops cost $25 and participants recieve a complete midi interface board for the dorkboard/arduino. 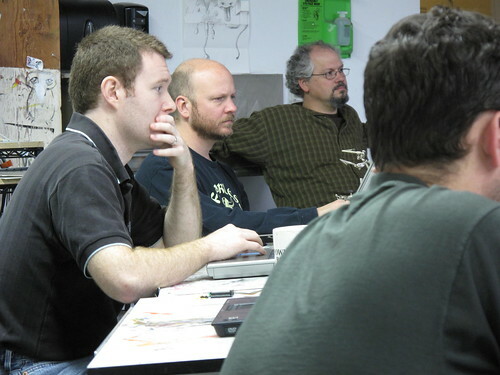 Workshops are usually held at PNCA (NW 12th and Johnson). You can find out more on the official Dorkbot PDX website. 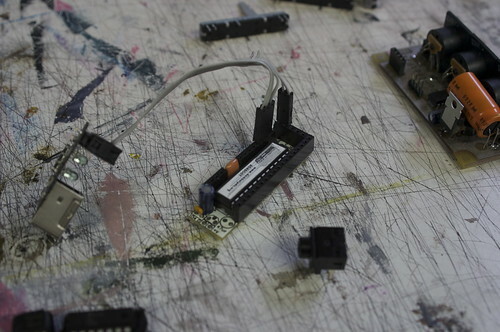 The Arduino philosophy is based on making design rather than talking about it. 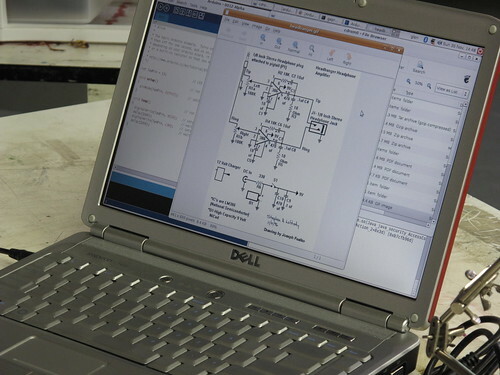 It is a constant search for faster and more accurate ways to build better prototypes. The classic engineering relies on a strict process from getting to A to B while the Arduino way is based on maybe getting lost in the way and finding C instead. This is he process of tinkering that we are so found of; playing with the medium in an open-ended way, finding the unexpected. In this search we also selected a number of software packages that enable that process, this constant manipulation of the software and hardware medium. “If you put your engineer’s head on, you’ll see things very differently vs. if you put your artist’s head on”, said Don. 30 Nov This entry was written by caseorganic, posted on November 30, 2008 at 5:21 pm, filed under activities, art, happiness, shiny things and tagged arduino, circuitboards, cybernetic orchestra, dorkbot pdx, engineering, pnca, sound, tempusdictum. Bookmark the permalink. Follow any comments here with the RSS feed for this post. Post a comment or leave a trackback: Trackback URL. Keep up the awesome coverage. I hope you’re able to make it to the event on the 7th despite the bad timing with CyborgCamp being the day prior.